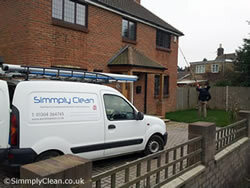 Simmply Clean provide window cleaning, carpet cleaning, shop sign cleaning and gutter clearance. Water fed pole window cleaning. Gutter cleaning pole system. Dry fusion carpet cleaning. Contact Simmply Clean 07838 745 902. This entry was posted on Monday, July 24th, 2017 at 2:07 pm	and is filed under Businesses, Contractors. You can leave a response, or trackback from your own site.